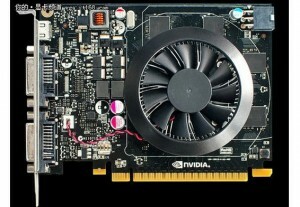 NVIDIA launched new models coming in weeks, low graphics card architecture Kepler, this time series low-end NVIDIA GTX 650. Its core is the GK107, the lower performance of the Kepler series used in the GTS 640. The improvement comes from the use NVIDIA GTX 650 memory GDDR5 DDR3 compared to 1 or 2 Gbytes installed. Its 384 CUDA cores, the operating frequency of 1 GHz or memory interface of 192 bits should result in a model solvent for basic computing tasks and multimedia playback for 3D games need even more than this GTX 650. The good thing is to be marketed at a good price. The image above is the first we see of this series and do not know if the final model or prototype. It uses a simple ventilation system and a six-pin connector offering additional dual DVI output. Beyond the adequacy of such models kits or home theater computers for low power consumption and noise, our recommendation is still the same: avoid low-end and high-end expensive also betting on models like the NVIDIA GTX 660, the most balanced between performance and price.